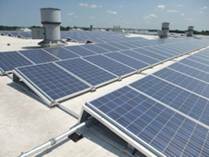 On behalf of Montgomery County (County) the Northeast Maryland Waste Disposal Authority (Authority) developed this solar project on the roof of the transfer station building. The Authority’s role included managing the grant, overseeing construction and contract negotiations. Maryland based SunEdison LLC won the competitive procurement to own, design, permit, install and maintain the 1,200 solar panel array. Electricity generated from the array is used to operate the scale house and County office space in the Transfer Station. The Authority negotiated a twenty year power purchase agreement with Sun Edison. This contract has a novel twist on the standard solar contract; SunEdison LLC retains all Renewable Energy Credits (RECs), environmental attributes, tax credits and other credits accruing to the owner of the system, sells electricity to the Authority AND provides solar RECs equivalent to the production of the system (“REC Swap”) to the County. The Authority secured grant funding through the Maryland Energy Administration, which further reduced the electricity cost to the County, and as a result, less waste disposal costs for the County’s ratepayers. Construction of the 280 kW DC array was completed in January of 2011. The Authority also conducted oversight management of the construction. 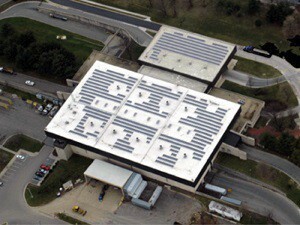 SunEdison used several Montgomery County based sub-contractors to complete the project. The array will generate approximately 345,103 kWh in the first year of operations and over six million kilowatt hours (kWh) over the initial twenty years of the project. The solar array will reduce greenhouse gas emissions equal to 60 cars each year for at least 20 years. 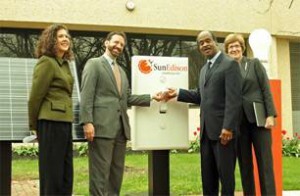 (from left) Franny Yuhas, manager, SunEdison; Malcolm Woolf, director of the Maryland Energy Administration (MEA); County Executive Ike Leggett and Robin Davidov, Executive Director of the Northeast Maryland Waste Disposal Authority (NMWDA) symbolically “flipped the switch” for the solar array on April 18, 2011.